Can Your Dog Tell If You Use Drugs? Hey. This article deals with some heavy stuff, but we’re not here to judge. We are not here to make light of individuals overcoming substance abuse problems. Just never give alcohol, tobacco, or other harmful drugs to a dog. Got it? …but in the way that they have exponentially heightened senses compared to humans. It’s widely known that a dog’s sense of smell is tens of thousands of times more potent than a humans, but did you know that dogs can sense even the slightest change in your behavior? According to Dr. Gary Weitzman of the San Diego Humane Society, dogs are “proficient mind-readers”. They can recognize when there is a change in our body posture, mood, behavior, and emotions, especially if the dog knows you well. But can a dog tell if a human uses or abuse drugs? That one is a bit more complicated to explain. Alcohol is a drug which has an incredible effect on a person’s behavior. Whether you’re just having one or two, or like to get “tipsy”, it’s easy for dogs to tell when you have alcohol in your system. Given dogs can sense the odor of everything from cancer to whale poop, it’s safe to say they can smell it on your breath. They can probably see it in the way you move and detect it based on the volume and tone of your voice. People who abuse alcohol, as in, people who have more than 5 drinks per day, will rarely find themselves without a blood alcohol content. Dogs are able to pick up on this residual alcohol in your system, and may behave differently towards you should this behavior become consistent as alcohol abuse leads to personality changes. If someone gets stoned, their dog knows it. Besides the fact that marijuana has an incredibly potent smell for even the human nose (I’m looking at you, guy who lives in the apartment across the hall from me), marijuana also has a major effect on a person’s behavior. Although a dog may be thrilled that their stoner owner keeps a bevy of snacks in the house, smoking marijuana around a dog can be potentially dangerous to his or her health. Since the legalization of recreational marijuana in some states, vets have begun to notice a rise in a dog related illness called marijuana toxicosis. Although there’s a slim possibility a dog would die from marijuana consumption, allowing a situation where a dog might consume marijuana is just plain wrong. Some dogs are bred specifically to learn how to sniff out highly trafficked drugs, like marijuana, cocaine, and meth. They are trained from birth to smell for certain chemical compounds in these drugs, allowing them to sniff out these compounds at airport security checks and drug raids. 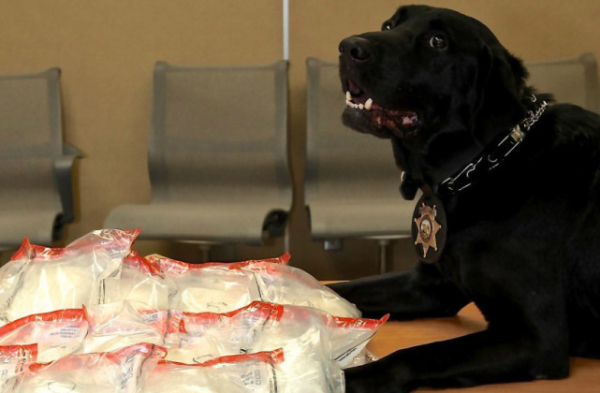 Assuming most people don’t own a specially trained drug sniffing dog, domesticated pooches would have a difficult time detecting cocaine abuse in his or her owner. That being said, consistent use of this drug will cause serious mood swings in a human which their dog would not fail to pick up on. Arguably the most dangerous drug police dogs are trained to sniff out, methamphetamine is a drug your dog will know immediately if you’re abusing. The effects methamphetamines have on a user is a whole body experience, with effects including euphoria, mood swings, hyperactivity, and increased blood pressure—something some dogs are trained to smell. Yes, they can smell high blood pressure. Your dog will pick up on each one of these changes in your behavior and will react accordingly, possibly becoming distant and fearful of having you as an owner. If you abuse this drug with a dog, prepare for some serious consequences.